I Thought I was a Smith: Oops, where did George go? A street in Bickington, taken in about 1900. I believe that George's family lived in a house very much like these. 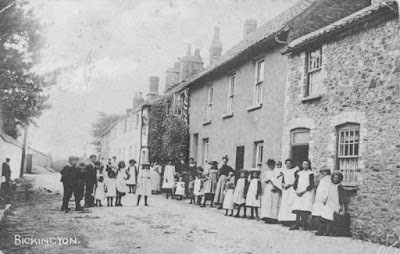 George was born in 1851 and spent his childhood, with four sisters and seven brothers, in the village of Bickington, a small enclave in the parish of Fremington in northern Devon. His father William was an agricultural labourer, and as the children grew up, several of them also went to work for local farmers when they were still in their teens. One would expect young George to do the same. I’ve found him as a 10 year old schoolboy in the 1861 census, but in 1871, when he was 20, he seems to have eluded the census-taker (and not for the last time – but more on that later). His parents and siblings are easy to find, but there's no sign of George. In 1875, he shows up in Plymouth, getting married. But when did he go there, and why? but today it's just 60 miles or so down the A386. But why did George make the journey sometime before 1875? Jumping way ahead. George’s obituary says that he was in the Royal Marines – if so, that would explain why he was in Plymouth, and it might also explain why he ‘disappeared’ in 1871. Although ships’ companies should have been enumerated in the UK census, wherever they were in the world, it’s quite possible that some were missed, or lost. However, other than the obituary (which was written by a friend who made a few mistakes about other things), I’ve found no evidence whatsoever that George ever joined the Royal Marines or any other branch of the services. So where did his friend, many years later, get that idea? Apparently George, or perhaps one of his children, told him something along those lines. Did George join the Navy or the Marines using the name Thomas Smith? Well, I’ve searched for him with that name too, and haven’t found any likely candidates. And in any case, when he got married in 1875, he was still using the name George Cockram. His occupation at that time, according to the marriage record, was ‘labourer’. Not very enlightening. So what did George get up to as a young man? Was he a deserter from the Marines, and his records there have simply gone missing? But if he deserted, he wouldn't be likely to tell anyone that he had ever enlisted, so I think that's not likely. Did he commit a crime of some sort and escape the clutches of the law? Did he get a girl pregnant and run away from his responsibilities? Or get into serious debt that he couldn't repay? Hi Linda. I have just discovered your blog and I must say you are keeping me very interested! Great work. Thanks, Sharn - glad to have you aboard!